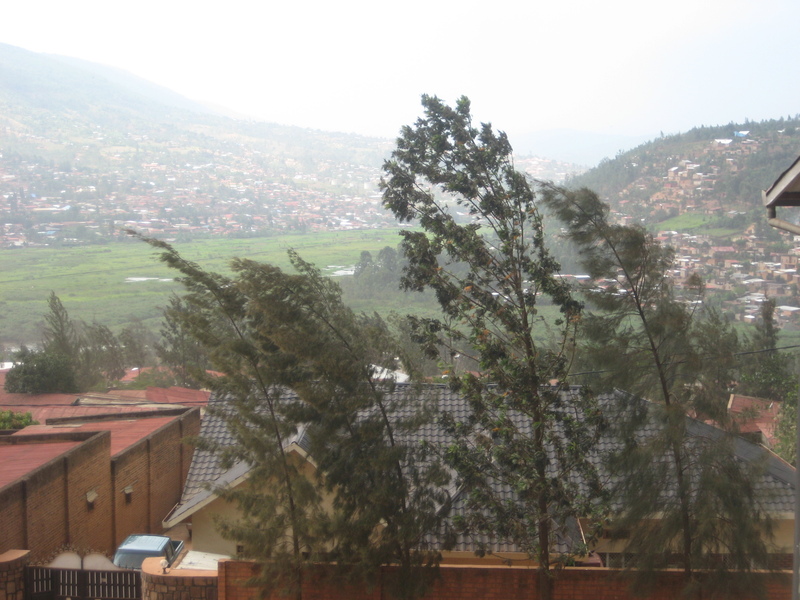 Kigali's Weather and Climate: Not as dull as you'd think! 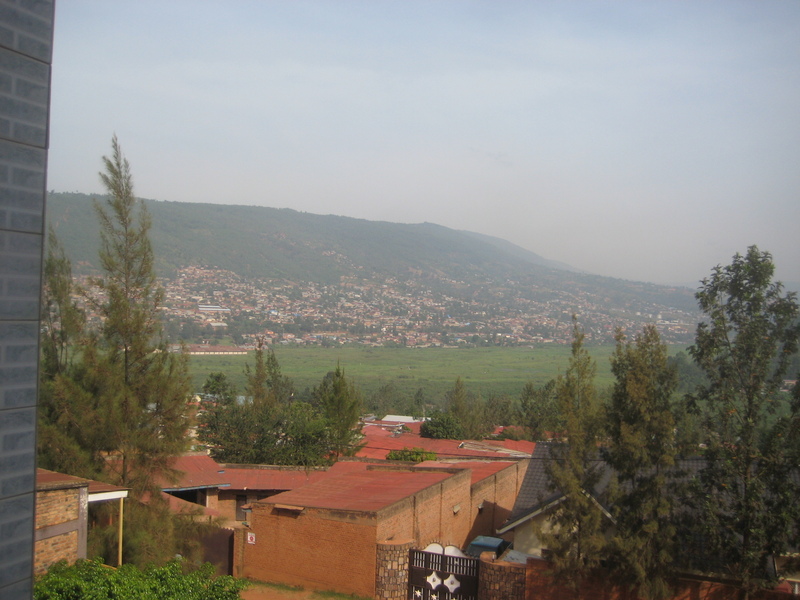 Kigali is in the mountains. Way up in the mountains. As high as Denver, Colorado even. But without any of the flat plains - except for the slim valleys snaking between the hills where there aren’t any houses presumably because of the looming threat of flooding. Car engines roar as they try to make it up some of the hills. Only the most skilled manual transmission drivers can make it 50 Kigali-miles without stalling out. Even automatic transmission cars tend to stall on hills like these. At first, I wondered to myself why this was chosen as a location for a major city. Then I experienced the climate. 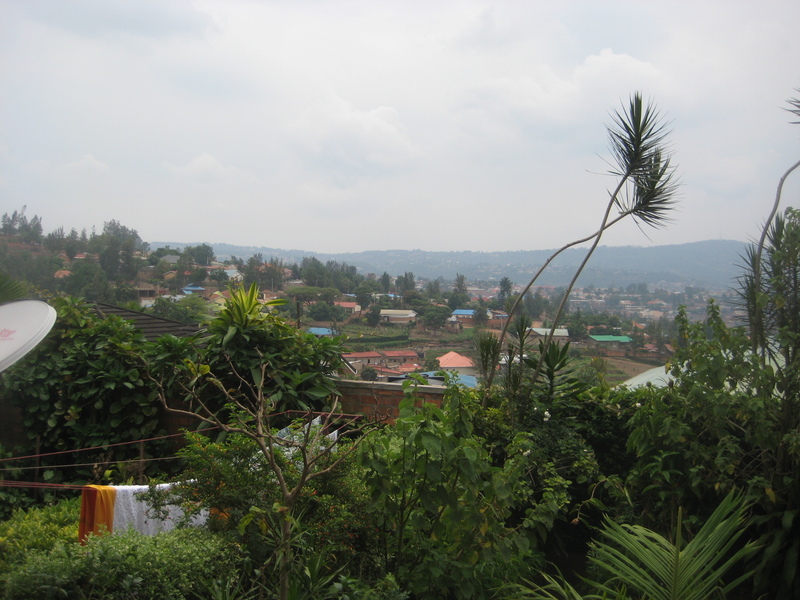 It’s near the equator, so despite Kigali’s elevation there’s no snow, and annual temperatures stay between 60F and 80F (15C to 28C) year round. Yes, all year round. In fact, seeing an air conditioner is rare here – the unpredictable and intermittent cloud cover shields houses and buildings between bouts of pounding sun. Even ceiling fans are scarce. For a major city, it’s also green. Looking at the hillsides, you see a lush, forest green backdrop with red rooftops clustered together separated by thin rows of trees. Also scattered on the distant hills on the outskirts of the city are small open plots of farmland awaiting cultivation or harvest. Everywhere there’s a view. Everywhere. The balcony on the ground floor of my house overlooks a valley that glows with dim orange and white lights at night; my ride to work on the back of a motorcycle taxi is distractingly beautiful and I have to resist the temptation to risk pulling out my phone and snapping a few shots; even the view from my office window affords a view of mountains, changing color from a dark green to a dim blue to gray as they get more distant. This view from my desk often distracts me from my responsibilities as a Kiva Fellow! Yes, this place is beautiful, but it’s not all sunshine. Clouds and rain are common enough for most people to carry an umbrella at all times. The clouds can move in quickly: one day, my roommate saw the gorgeous weather and went to apply sunscreen only to be greeted by a sky full of clouds by the time she made it outside. The rain is also unpredictable. [As if to support me, the weather changed from sunny to pouring rain in the time spent writing this blog.] The wind gives a little forewarning, and the dark rain clouds are often visible from a distance, giving time to prepare. Before today’s rain, the wind picked up so heavily that the metal gates outside could be heard as they slammed together, trying to break free from the chains holding them. The wind attracted the attention of everyone in my office, stopping work to gaze out the window and witness Mother Nature’s force. High winds are an ominous sign... get ready for a downpour! On rare occasions, the wind and rain team up to wreak havoc in a dangerous duet, the rain coming down hard, and the wind pushing it into places people didn’t prepare for. Two of the four bedrooms in my house got drenched last week (one of them might as well have been outside), thanks to the wind pushing the roof’s draining water through a small gap above the gutter collecting it. At least the beam running across the house channeled the water into a straight line of drips making it easier to collect. When people ask me why I choose to live outside the comforts of the developed world, I normally respond by saying I find the predictability of life there a bit dull. I enjoy the chaos of the developing world; not knowing if you’ll have electricity or water sometimes makes everyday life an adventure. Kigali is far more developed than most other developing cities I’ve visited, but the climate here reminds me of why I love places like this. 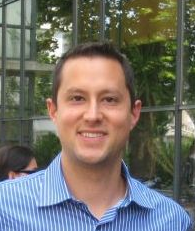 Mario Ariza spent his teenage years in Ghana and Egypt before returning to the United States to attend university in his home state of Virginia. After a decade, he was eventually compelled to return to the developing world and took a job at an investment bank in Ghana, where he implemented a pension fund for fishermen. Admittedly cynical of traditional aid models, he seeks market-based solutions to economic development, which is what attracted him to the Kiva Fellows Program.